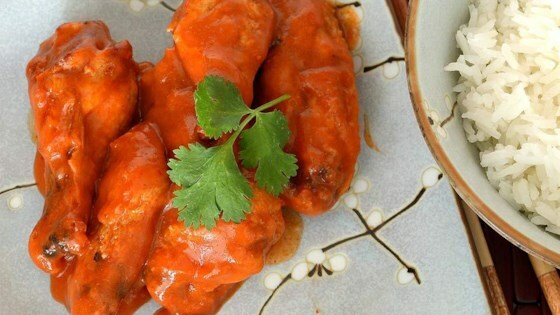 "A flavorful change from regular hot wings by using Thai flavors. You can adjust the amount of heat in these bold and spicy wings to suit your taste." Preheat oven to 400 degrees F (200 degrees C). Line a rimmed baking sheet with foil. Place the wings on a baking rack and set on prepared baking sheet. Bake until wing pieces are crispy and golden brown, 60 to 70 minutes. Whisk cornstarch and Swanson(R) Chicken Stock together in a bowl until smooth. Pour sauce mixture into a saucepan and bring to a simmer; add red curry paste, sriracha, brown sugar, fish sauce, and garlic powder. Whisk until smooth; bring to a boil. Reduce heat and simmer until sauce reaches your desired thickness, about 10 minutes. Toss wings in sauce, garnish with cilantro, and serve immediately. Great recipe. I served some as written and some with the sauce on the side for dipping. The sauce is really good over rice and veggies too. :-) Thank you for the recipe.